Catriona Crowe, the National Archives of Ireland's senior archivist responsible for the digitisation of the Irish Census, told me today that the 1901 census is now ready to upload and publish online, slightly ahead of schedule. However, approval for launch has to be confirmed by the Minister responsible, and this has yet to be received. The earliest possible launch date is 28 May. The latest 30 June. The online Irish civil registration index is not working correctly. The free search facility, which is a 'pilot' collection of the Family Search website (run by the Church of Latter Day Saints / Mormons), has been returning some strange and confusing records for a few days. It appears there is a fault caused during a recent upgrade of the site. Marriage records appear to be the worst affected, and the 'place' filter (for registration districts) is either not working or appears to have no command of geography! Since it was launched just under 18 months ago, this online facility has become a favourite tool for Irish genealogy researchers, especially for those who cannot get to the physical index books at the GRO Research Room in Dublin. While it is 'out of action', you might like to see if any of the alternative sources of birth, marriage and death records could be of help to you. 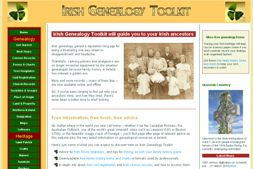 You can find details on Irish Genealogy Toolkit's Civil Registration pages. Irish Genealogy News will keep you up to date with any developments and will confirm when the online problem has been rectified. If you're curious to know more about Irish surnames, you'll find the three pages I've just added to my website fascinating. You can find out how the Mac/Mc and O' prefixes evolved, learn how many of the best-known Irish last names in fact originate in France and how very few evolved from placenames. Some of the most quoted myths about the surnames of Ireland are also debunked. Getting more specific, you can also find out about the 20 most common surnames (in 1890) as well as 10 randomly-chosen but well-known family names.